This morning I cycled 20.2 miles on my Schwinn 170. Current totals – 25,433.1 miles; 40,930.7 kilometers. I really like my new schedule of cycling: 60 minutes 3 times a week and Sunday a flex day for pedaling. I am also now doing 200 sit-ups 3 days a week. Like I said I love to eat and I do not want to reinstate a diabetes medication/chemical regime. My early morning blood sugar count was 96 mg/dL. 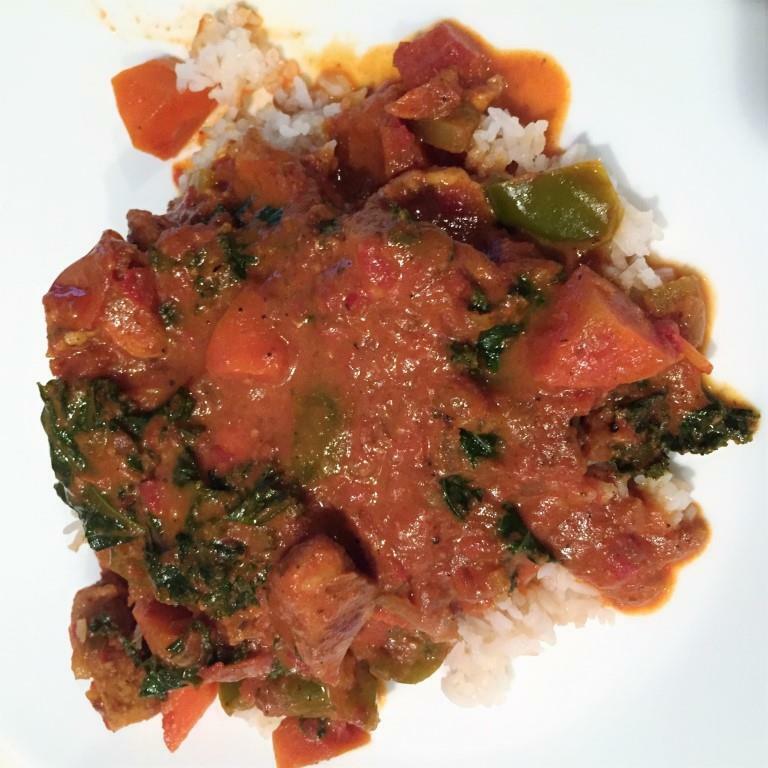 Last night’s supper was Butter Chicken, all cooked in the Instant Pot. Found the recipe at My Heart Beets. I didn’t have any Ghee or Clarified Butter in the house so I substituted Bacon Drippings. I also added Kale, Carrots, and Celery to the recipe. I have now completed 531.5 miles on my virtual Trek on Mars. This morning I have completed 68.6% of the next leg of my journey to the next destination and goal point. Overall I have now completed 4.0% of my Mars’ Trek and journey. 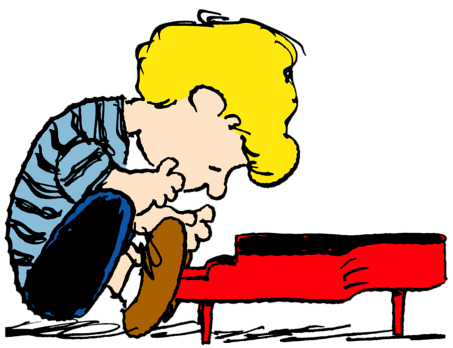 Some food for thought, apart from the garbage of the current political campaign ads, “Science Shows How Piano Players’ Brains Are Actually Different From Everybody Else’s”, Music.Mic, Jordan Taylor Sloan, June 2014. Work continues on our newest quilt, NPCF… and it has a new name “Hope Cures!”. This is my 1,292nd post. According to Blogger Jim’s Trek has recorded, as of this writing, 100,217 Pageviews. This morning I did NOT feel like getting on my Schwinn Fitness cycle. But I knew that if I didn’t I would have let that thought take me to where I did not want to go. I started a bit later than usual but I did cycle 19.8 miles this morning on my Schwinn 170. My totals – 25,412.9 miles; 40,898.2 kilometers. 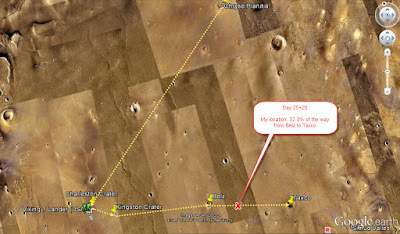 On Day 26+21 of Part V on my Trek I have cycled 511.3 miles on Mars. I am have completed 50.3% of the distance to Taxco Crater. 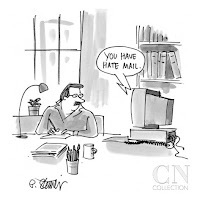 The mail has just arrived. 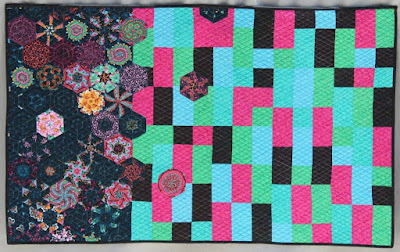 Andy and I have been informed that our 2 quilts - Diamonds and Elation - have been selected by jury "to be judged and displayed in the Evolving quilt competition at the Pennsylvania National Quilt Extravaganza from September 15-18, 2016." 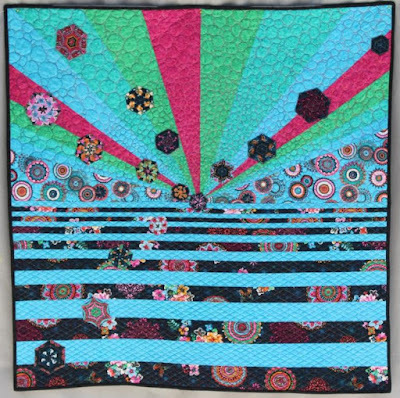 Also our 2 quilts - Light Bringer and Sea and Sky - will be judged and on display at the 2016 Cabarrus Quilters Guild, Splash of Color September 30 and October 1, 2016. 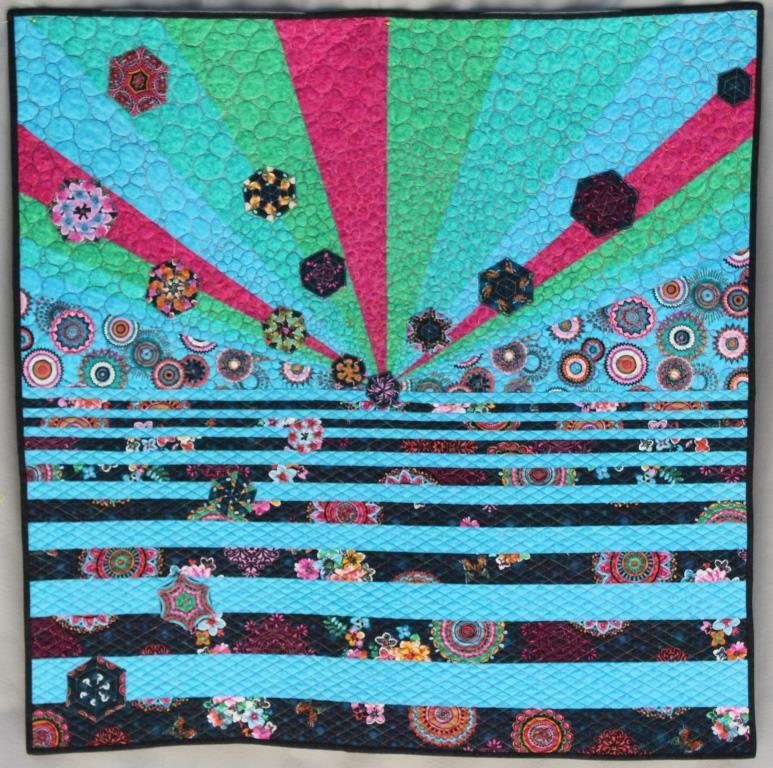 Splash of Color show will be held at the Cabarrus Arena & Events Center, 4751 Highway 49, North Concord, NC 28025. This is my 1,291st post. According to Blogger Jim’s Trek has recorded, as of this writing, 100,126 Pageviews. 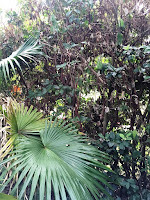 Today Jim’s Trek Blog celebrates hitting and going over 100,000 Pageviews. This morning I pedaled another 18.7 miles on my Schwinn 170. Totals to date – 25,393.1 miles; 40,866.3 kilometers. 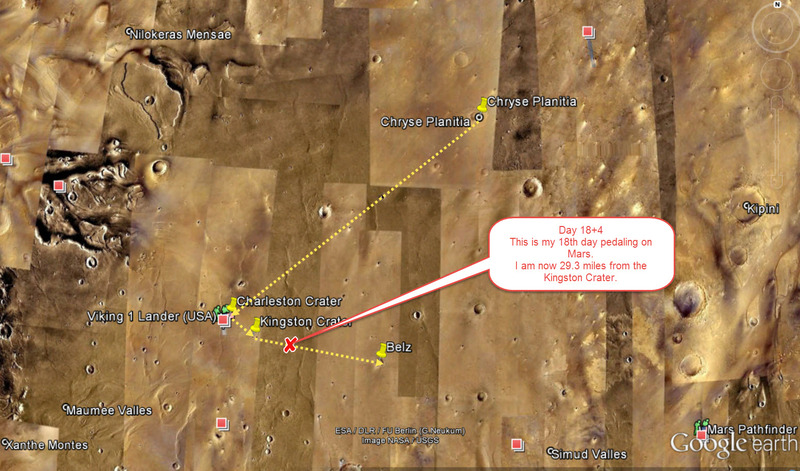 On the virtual part of my journey I have completed 491.5 miles on Mars. Suppose that one is incarcerated, one does have to eat. And when one is imprisoned under the auspices of our tax dollars, is it really newsworthy to be reporting on the various alternate ways one can gastronomically concoct dishes de fare as “Cooking with ramen: Prisoners get creative”? BBC News, Marysia Nowak, Aug 24, 2016. 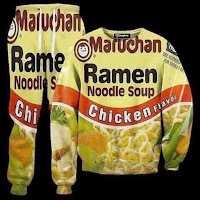 And yes I read but stopped at the mixing of orange Kool-Ade and Pork Rinds. 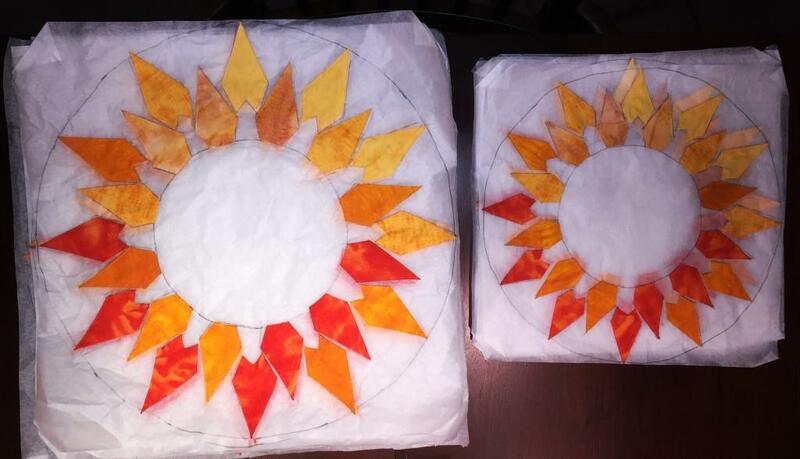 NPCF Quilt Update - 6 small (11 ¾” diameter) and 5 medium coronas (17" diameter) completed. This is my 1,290th post. According to Blogger Jim’s Trek has recorded, as of this writing, 100,039 Pageviews. This morning I pedaled 19.5 miles on my Schwinn 170. (I can virtually hear the yawns.) Totals now stand at 25,374.4 miles; 40,836.2 kilometers. 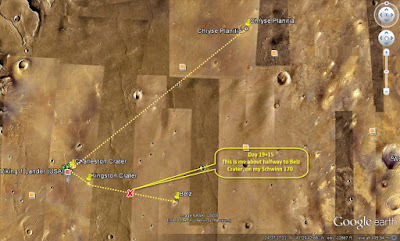 Day 24+19 on Mars and I have reached, on my Schwinn 170 the Belz Crater. I am continuing on to the Taxco Crater. The distance between the Belz and Taxco craters is 110 miles, per WolframAlpha. I have now completed 15.3% of that journey. My reading list – Currently I am reading A Natural History of Dragons – A Memoir by Lady Trent by Marie Brennan. 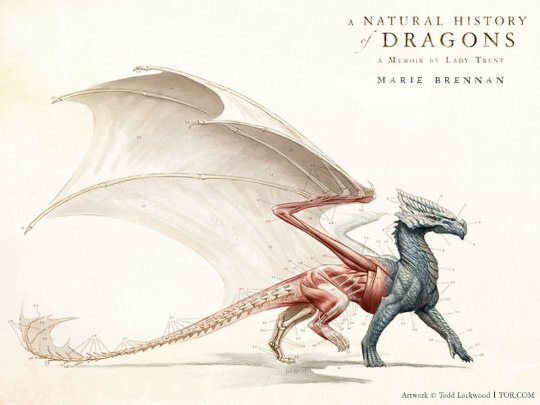 A very interesting twist on a fantasy fiction work tweaked as a memoir. NCPF Quilt update – All rays have been created. Now begins the construction of the wreath-like structures. There are 6 small, 5 medium, and 1 large. 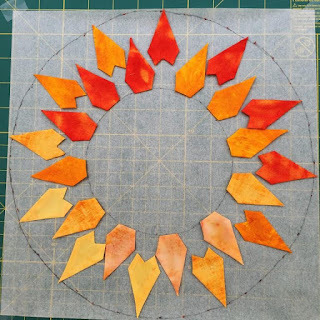 The diameters of the small one has been calculated at 11 ¾”. This is my 1,289th post. According to Blogger Jim’s Trek has recorded, as of this writing, 99,958 Pageviews. A great day, even with the Tampa humidity to have the house open and breathing. 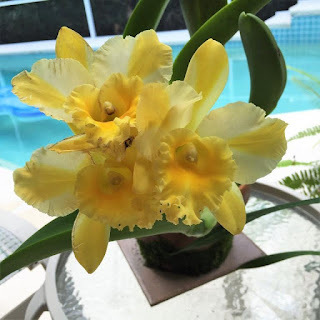 Orchids are blooming. 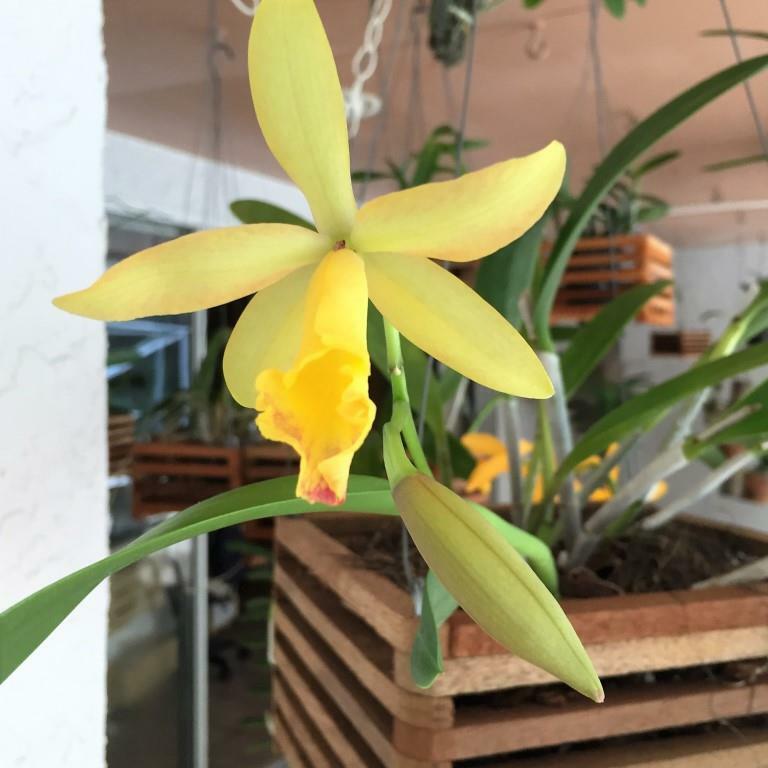 Yellow is the chosen color. Yes that is the pool behind. Be-damned the humidity and heat, all I have to do is walk out and plunge in. And a truly classic way to see and listen to the spirit of song and people, and the joy of diversity soaring. This morning I cycled 19.7 miles on my Schwinn 170. Totals: 25,354.9 miles; 40,804.8 kilometers. 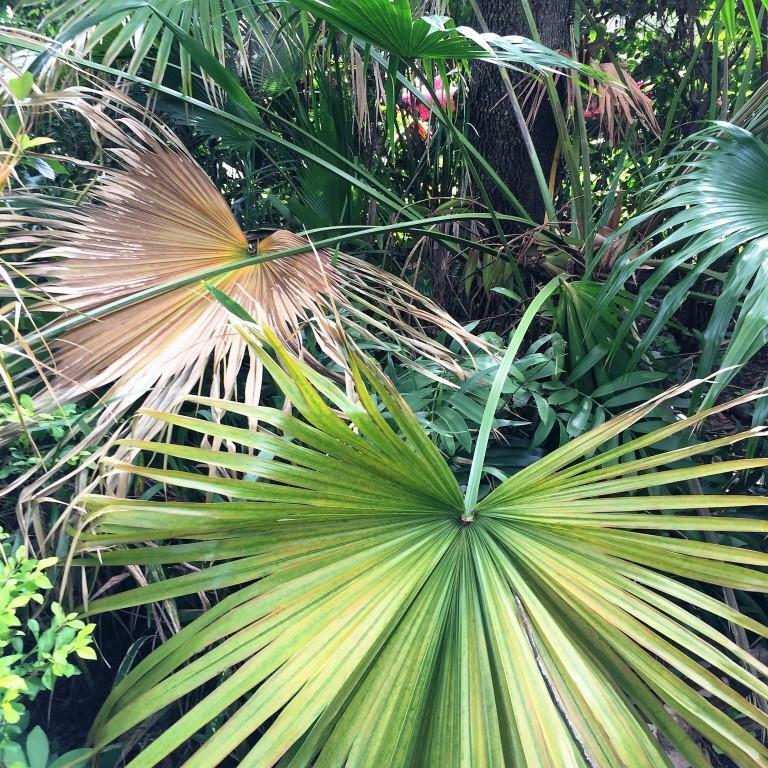 Part V – 453.3 miles. 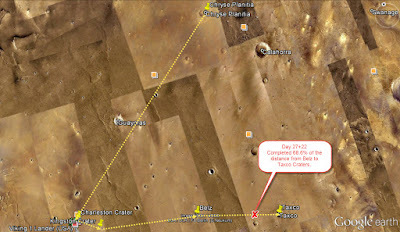 I now have another 2.7 more miles to go to arrive at the Belz Crater. And it appears that I have found my next destination and goal point. According to WolframAlpha my new goal point is the Taxco Crater. 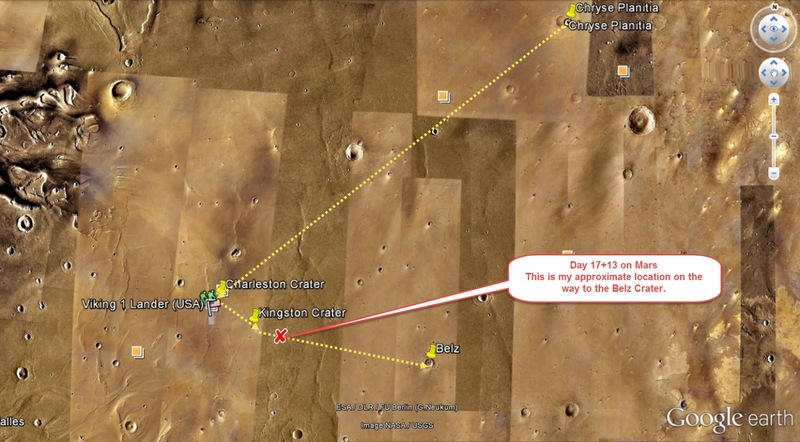 It is 110 miles sort of east from the Belz crater. Congratulations to A&L. Christmas Packages II has found a new home. This is my 1,288th post. According to Blogger Jim’s Trek has recorded, as of this writing, 99,913 Pageviews. Labels: #jimsmithjkls, #jimstrek, #jimstrekIV, #jklsmith, #quiltssb, 2016, Jim Smith, Jim's Gotta Eat, Jim's Trek, Jim's Trek V, jklsmith, Mars, Quilts SB, Schwinn 170, Schwinn Fitness Cycles, WolframAlpha. This morning I cycled 19.5 miles on my Schwinn 170. Totals: 25,335.2 miles; 40,773.1 kilometers. 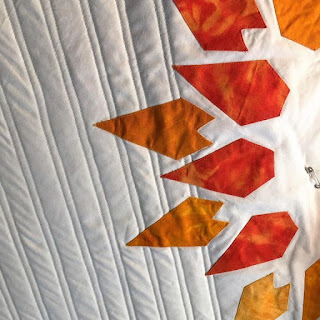 Part V – 433.6 miles. 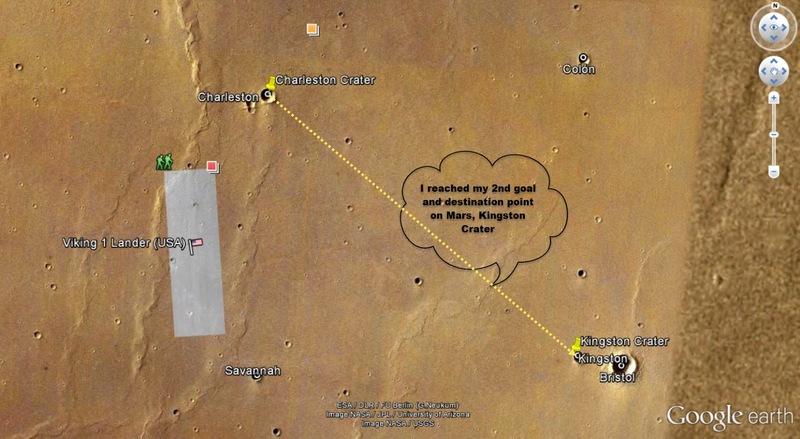 I am now 82.7% of the distance to the Belz Crater. Looks like I will have to find another destination and goal point. 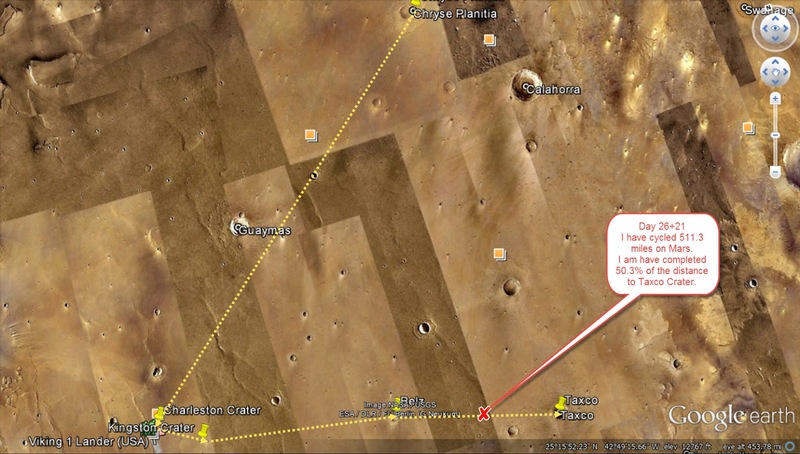 My Goggle Earth on Mars program does not seem to be providing the regular labeling of crater sites this afternoon. Hopefully I won’t be cycling blind toward my next destination…that is, if I don’t know where I’m going. 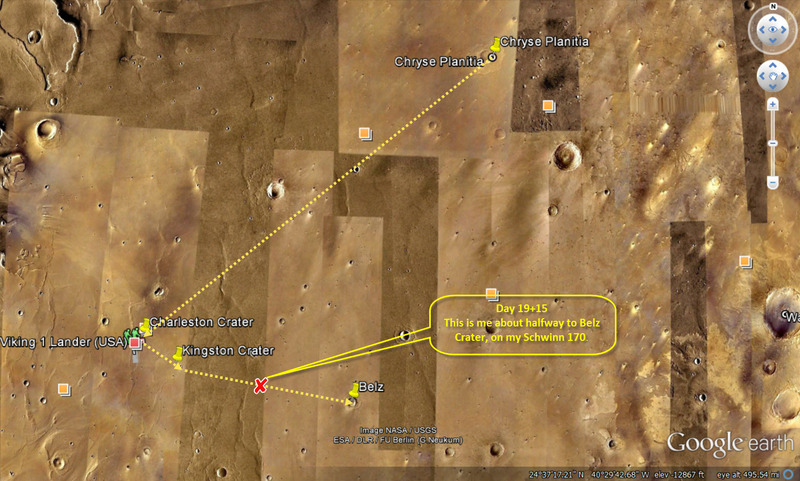 When my Internet connection went down this morning, my Bright House Internet connection, I lost my connection with myself at my location in Mars. 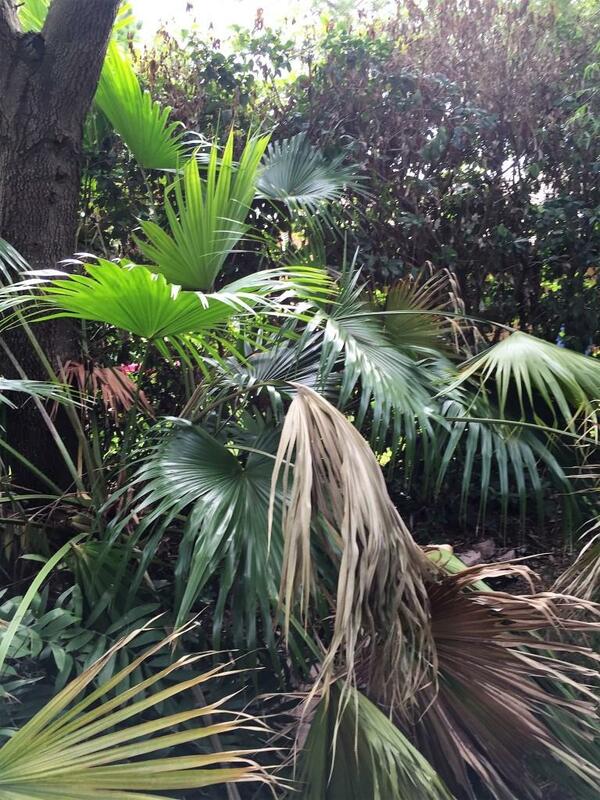 ""NYC Parks stands firmly against any unpermitted erection in city parks, no matter how small," parks spokesman Sam Biederman jokes..."
This is my 1,287th post. According to Blogger Jim’s Trek has recorded, as of this writing, 99,850 Pageviews. This morning I pedaled 18.8 miles on my Schwinn 170. My totals – 25,315.7 miles; 40,741.7 kilometers. I think I am adding back a 4th day of cycling. My schedule will be M, W, F and Sunday. Sunday will be a sort of swing day for cycling; if I do it I do it and if I don’t I will not be worried and bothered. I have now traveled a total of 414.1 miles on Part V of my Trek. 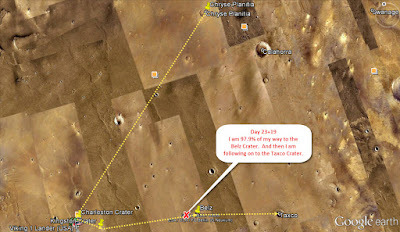 I have pedaled about 67.9 % of the distance from the Kingston Crater to the Belz crater. 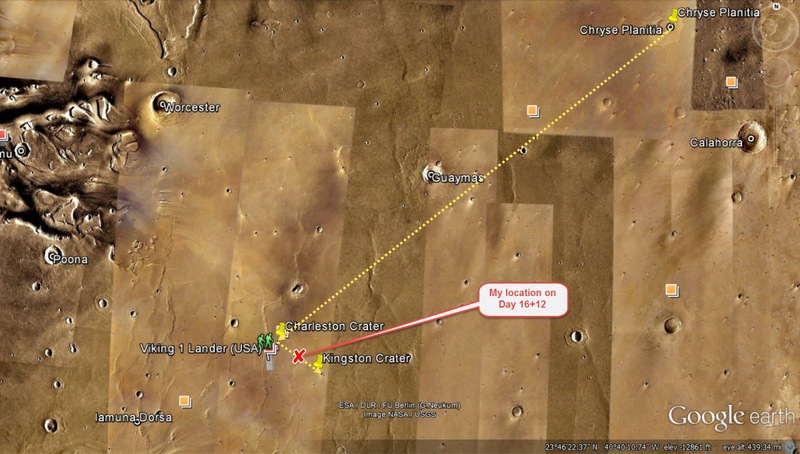 According to WolframAlpha the distance between the two craters is about 130 miles. Do not assume that the outcome of the November elections will go the way you want them to go. Be logical and make sure that you investigate all that there is to know, that which is being released, about the choice of candidates. Maybe it is time to realize that the roots that you have maintained all these years, the side of the aisle that you have chosen, may not be as secure as you thought that it should be. 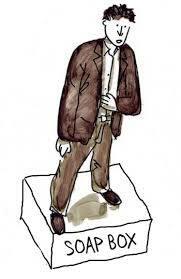 And then again the grass in not always greener on the other side. 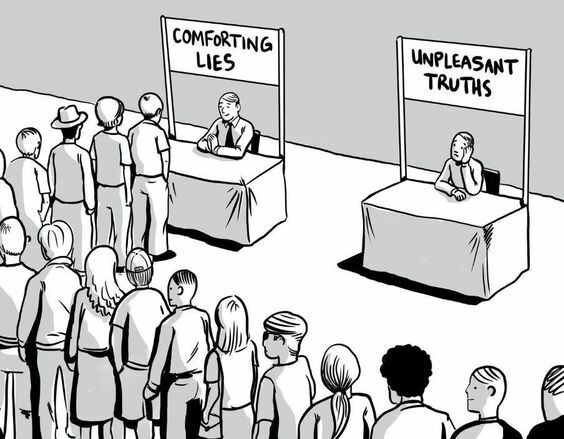 Make sure that you listen and investigate the claims of the candidates of choice. 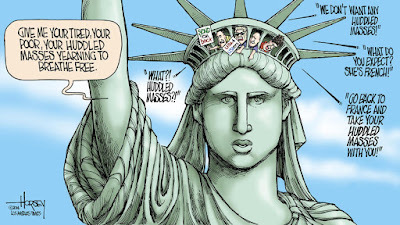 Supposedly they will represent you. Your voice and vote translates to their voice. 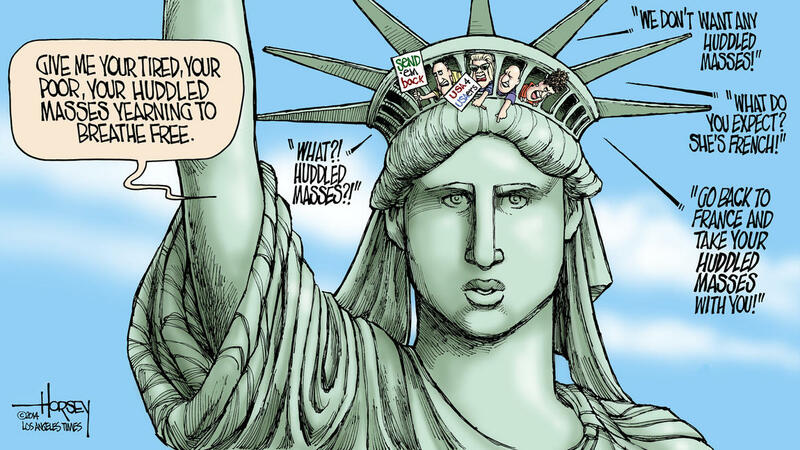 That is our democracy. 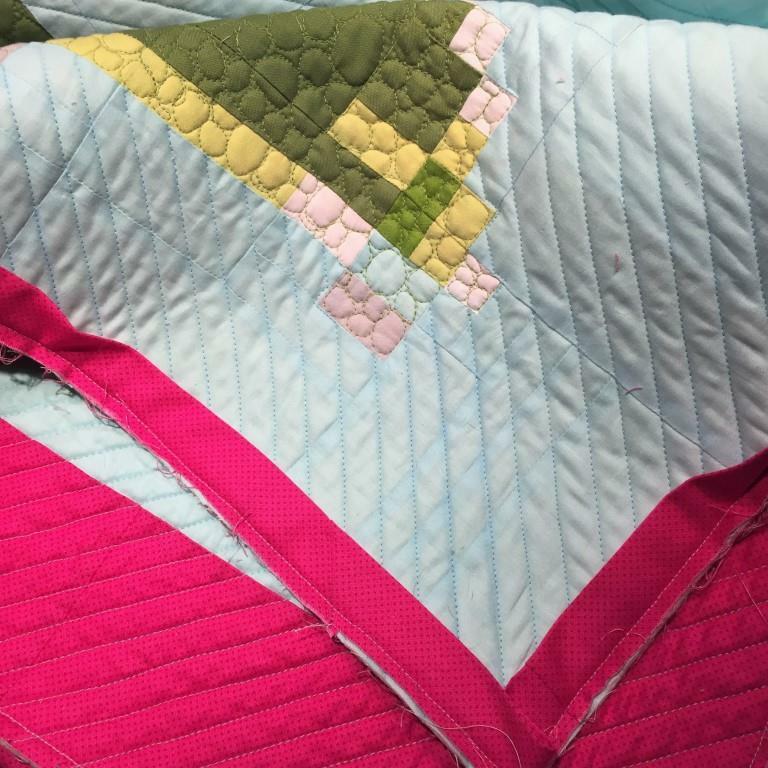 Work continues on our new quilt NPCF. All-things-being-equal Owl has been delivered to the front porch of its new home in South Carolina. 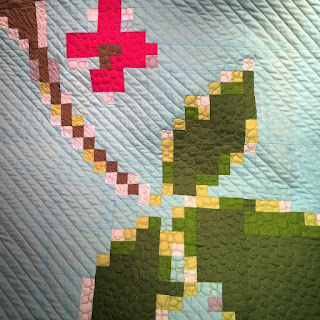 Check Quilts SB for the complete write-up of our work and effort. This is my 1,286th post. According to Blogger Jim's Trek has recorded, as of this writing, 99,773 Pageviews. This morning I pedaled another 20.0 miles on my Schwinn 170. On my 1,182nd day of pedaling I have now completed 25,296.9 miles; 40,711.5 kilometers. 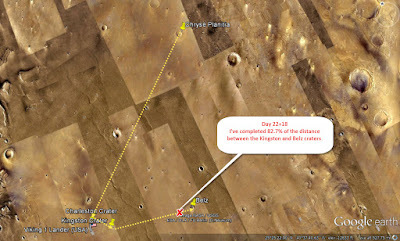 On Day 20+16 you do realize that I am plotting a virtual journey on Mars. The pedaling on my Schwinn 170 is the real part. 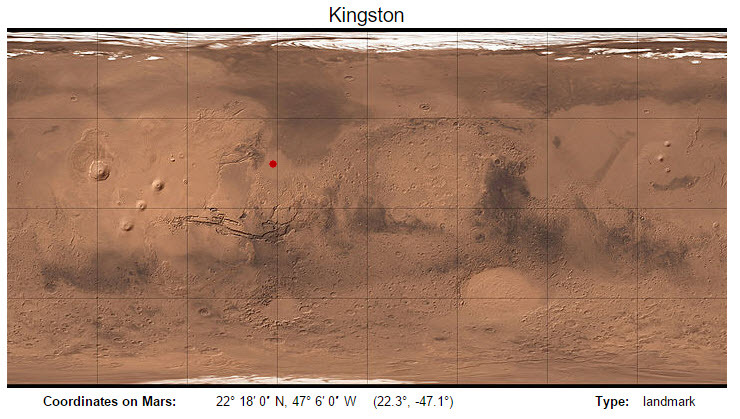 The plotted lines on Mars are the virtual part. 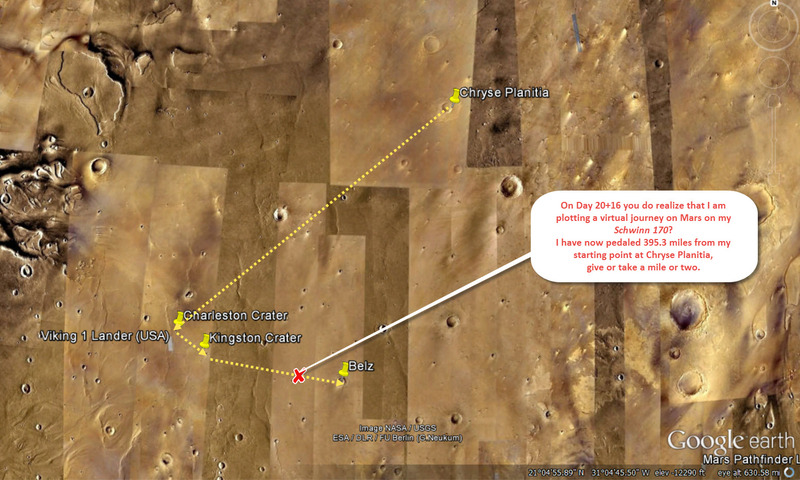 I have now pedaled 395.3 miles from my original landing (starting, that is) point at Chryse Planitia. And yes lightning hit about 10-feet from my house. This was last week and I am just now realizing how close it did come as I cleaned out the dead palm and branches yesterday. Yes, we were in the house and there was an amazing flash of light in the house and then this tremendous ka-boom. My PC and all the power went out. So far the only damage that I can account for is the Bright House router box and the external lightning and electrical system in the front yard. Racking up the tally this is I think the 7th time this house has been hit by either lightning or by some major electrical surge. Oh yeah, everything's fixed now. I really, really, really like my new Instant Pot. 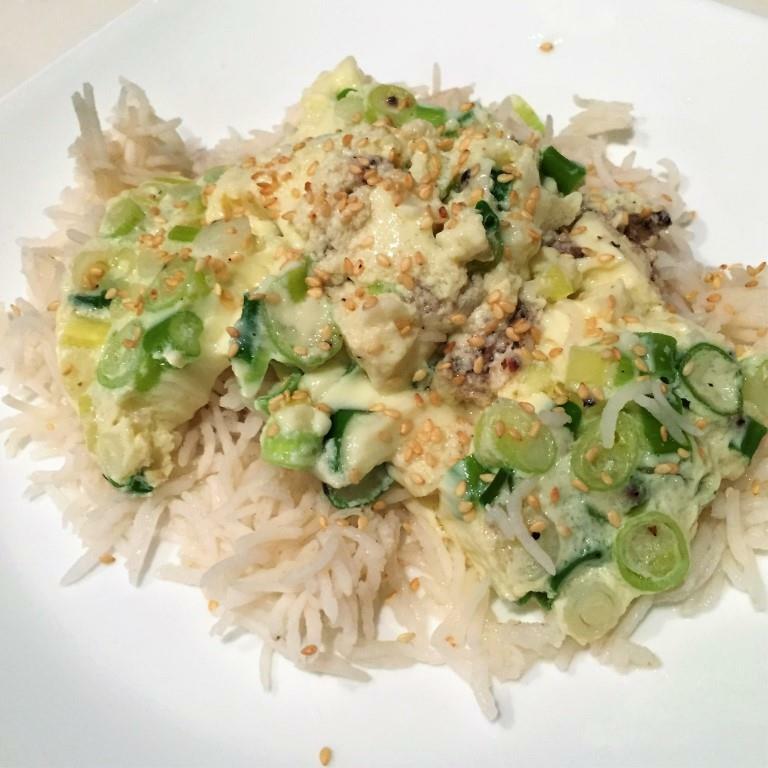 Tonight I’m going to try Pak Cham Gai Fan – otherwise known as Chinese-Style Steamed Chicken. It’s supposed to be an 11-minute Instant Pot recipe. We’ll see? And yeah my blood sugar dropped 13 points this morning to 105 mg/dL. Right direction but I have to really take a gander at the way I am eating, especially since I have reduced the number of days that I am pedaling on my Schwinn 170. One should not think that the polls are the voters. 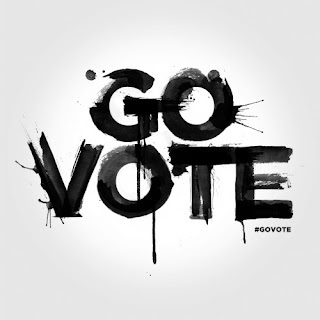 If you stay at home and let others do it you may be in for a surprise come the day after election day. 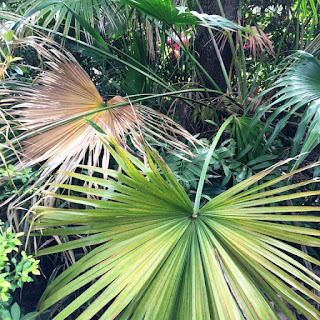 This is my 1,285th post. 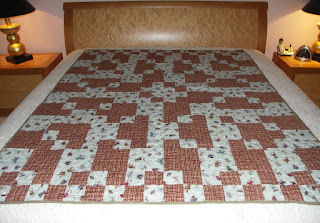 According to Blogger Jim’s Trek has recorded, as of this writing, 99,636 Pageviews. This morning I cycled 20.0 miles on my Schwinn 170. Totals now stand at: 25,276.9 miles; 40,679.3 kilometers. I am about halfway along the distance from Kingston Crater to Belz Crater. 1st attempt Instant Pot -Korean-Style Steamed Eggs. A definite plus - Sort of like a savory flan/custard served on rice. Ingredients: Eggs, water, scallions, sesame seeds, salt and pepper... and rice. 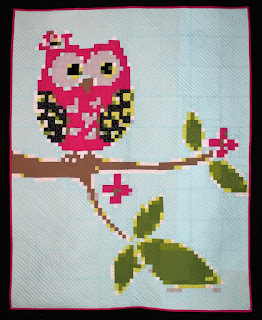 Our new quilt Owl has been completed. Label’s attached and it is ready for its new home. Stay tuned to Quilts SB for my final write-up and images. This is my 1,284th post. According to Blogger Jim’s Trek has recorded, as of this writing, 99,513 Pageviews. This morning I pedaled my Schwinn 170 19.6 miles. Totals clocked as of my 1,180th day of cycling are: 25,256.9 miles; 40,647.1 kilometers. 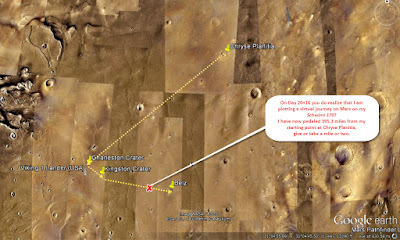 My next destination is the Belz Crater. 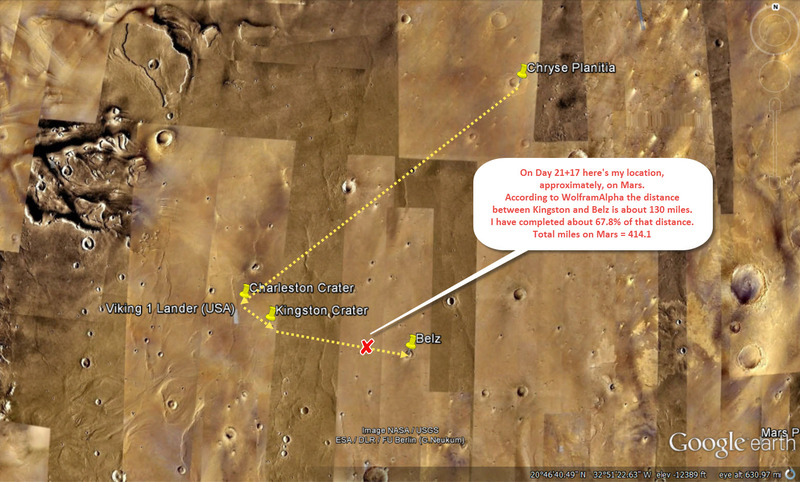 According to WolframAlpha the distance from my original starting point, the central point of Chryse Planitia to the Belz Crater is 220 miles. 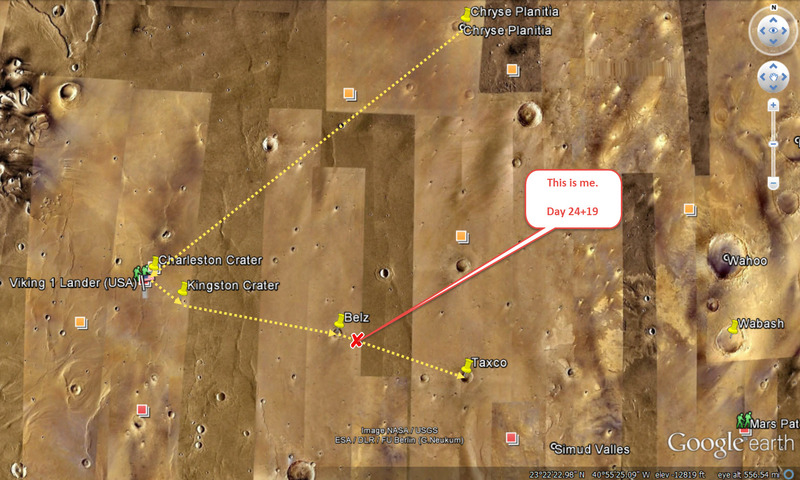 This is a shorter distance as compared to the Charleston Crater – 300 miles, and the Kingston Crater – 290 miles. All-things-being equal it looks like I have and will be traveling, virtually of course, on a sort-of circumference of a circular path created by the radii of the distances from my starting point in Chryse Planitia. The coordinates of the Belz Crater are 21° 30’ North and 316° 40’ East. “Republican strategist Ron Bonjean, who hasn't endorsed Trump yet, never thought he’d see the day when solid-red Republicans were committing to Clinton. But he says Trump has pushed some in his party over the edge. “He hasn't made the case that he will take the governance part seriously,” Bonjean said… Bonjean also said he doesn’t see a trend. “I don't think Republicans are thinking she'll be a phenomenal president but...these Republicans who are breaking away from Trump would rather have the devil they know than the devil they don't know." 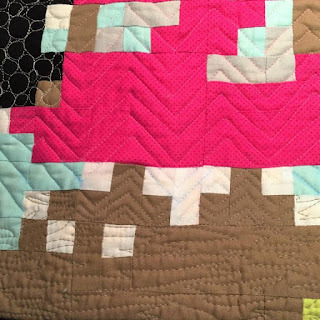 Our new Owl quilt has come into its own. 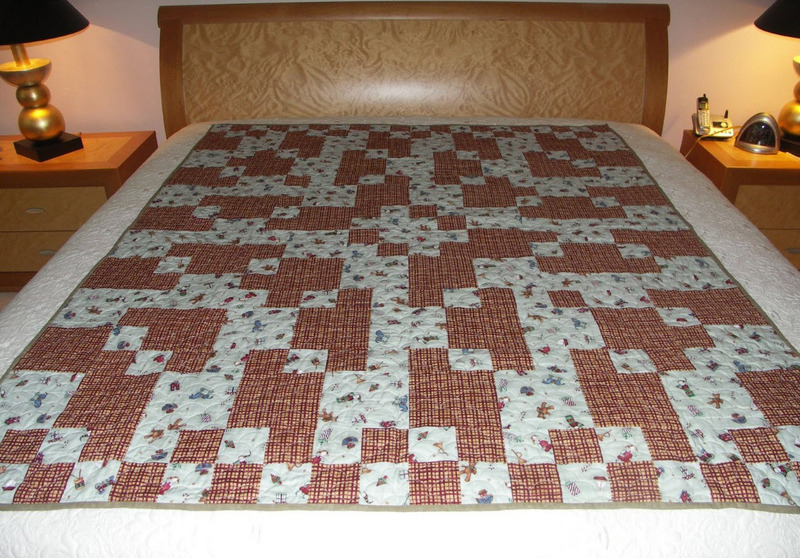 Top quilting has been completed and the binding is in the processed of been attached by hand. Looks like the final size will be 46 ¼” wide by 58” long. Follow our updates and work effort on Quilts SB at https://quiltsb.blogspot.com/. This is my 1,283rd post. According to Blogger Jim’s Trek has recorded, as of this writing, 99,422 Pageviews. This morning I pedaled 21.0 miles on my Schwinn 170. Totals now: 25,237.3 miles; 40,615.6 kilometers. I only have 97.48% of my committed distance left to go. I’m headed, I think, in a southeast direction from the Charleston Crater to the Kingston Crater. That distance I calculated to be about 36.0 miles and I had already gone 14.7 miles. This morning I reached the Kingston Crater and I still have an additional 9.7 miles to plot. 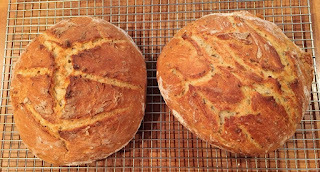 Fresh out of the oven, No-Knead Bread – Loaves #149 and #150. 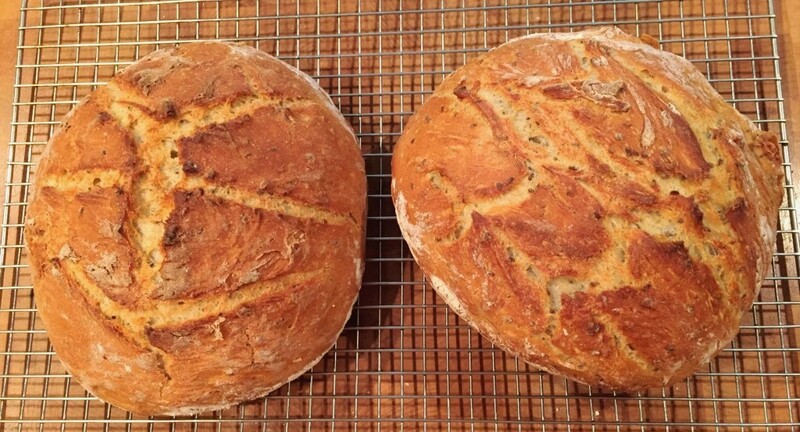 White (left) and Whole Wheat (right); both with Flax Seeds. 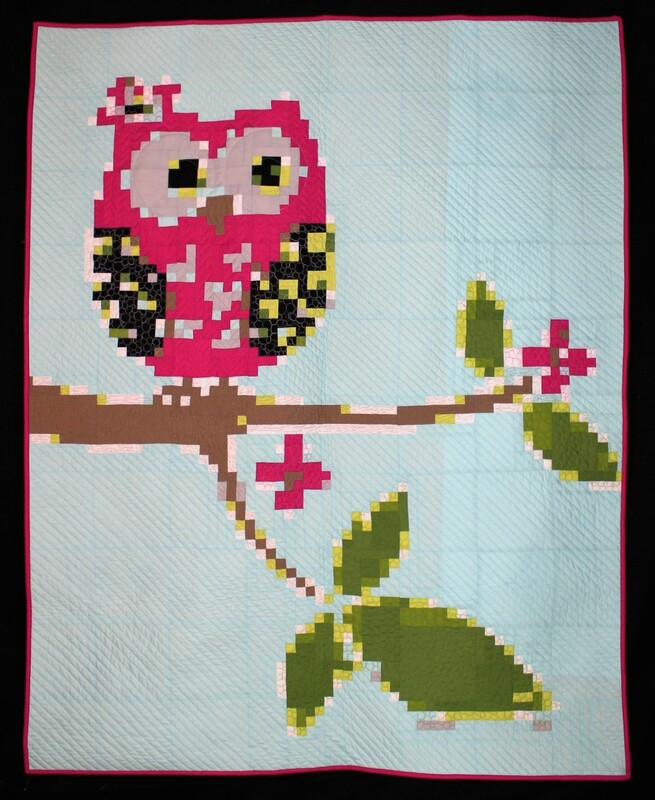 Our new Owl quilt and the quilting working is progressing. This is my 1,282nd post. According to Blogger Jim’s Trek has recorded, as of this writing, 99,350 Pageviews. This morning I pedaled 20.0 miles on my Schwinn 170. Jim’s Trek totals: 25,216.3 miles; 40,581.8 kilometers. 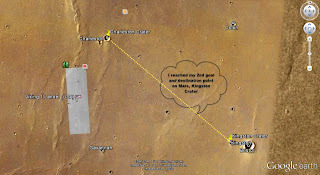 Today I made it to my 1st destination and goal point on Mars, Charleston Crater. Okay I’m learning. 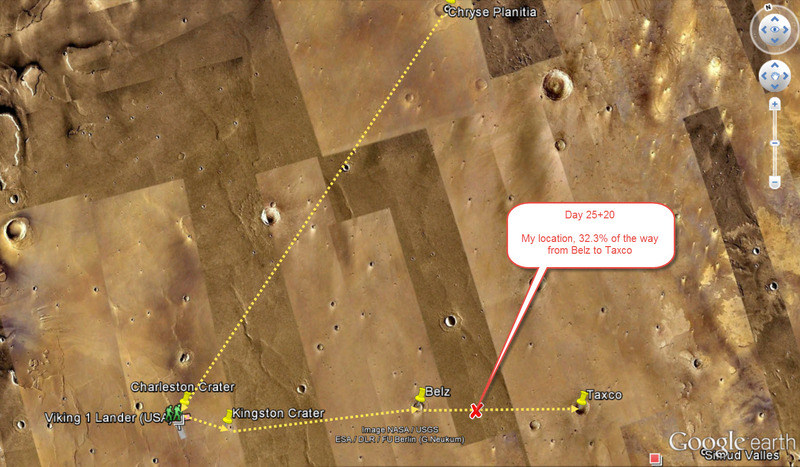 I’ve had to change the arrow of the location and the direction that I have been traveling, virtually of course, on my Schwinn 170 trek on Mars. 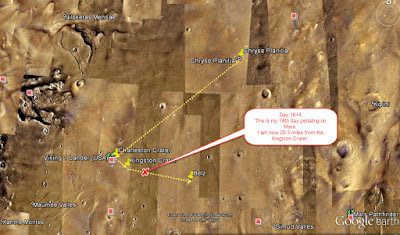 I was wrong about the location of Chryse Planitia where I began. Yes according to WolframAlpha I did cycle the 300 miles from Chryse Planitia to the Charleston Crater. Somehow I got my wires crossed and I thought Chryse Planitia was southwest of the Charleston Crater. In actual fact it is to the north east. Definitely, I’ve got to go back to the books. I have corrected them. Check out the new and corrected image. I did reach the Charleston Crater today. And I do like the adjustment to my mistake, (if I am correct); it does look like I have covered a lot more ground. And here is where my past, past life in geometry and trigonometry kicks in. 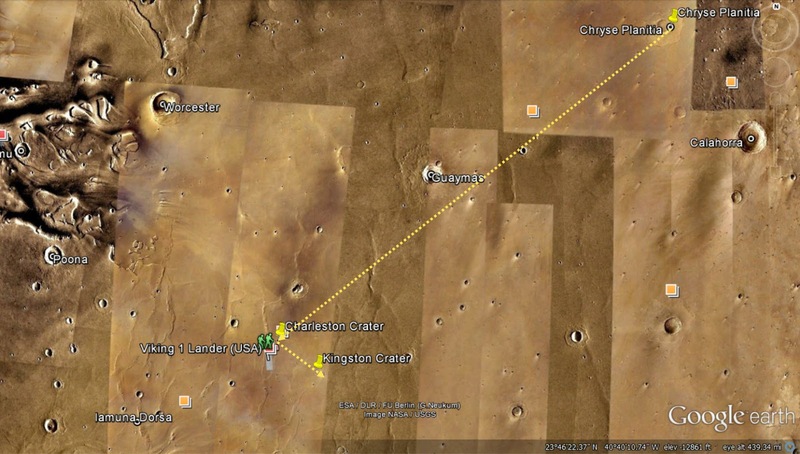 Point A is Chryse Planitia, B is Charleston Crater, and C is Kingston Crater (my next chosen goal point and destination). Based on WolframAlpha the distance from A to B is 300 miles and the distance from A to C is 290 miles. 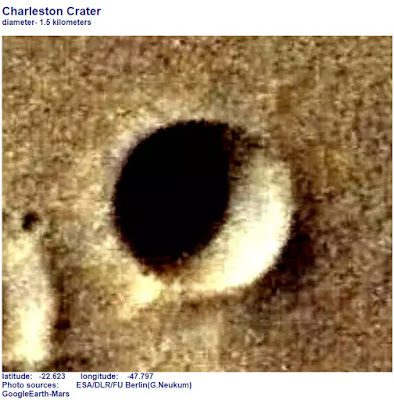 What is the distance from B – Charleston Crater to C – Kingston Crater? 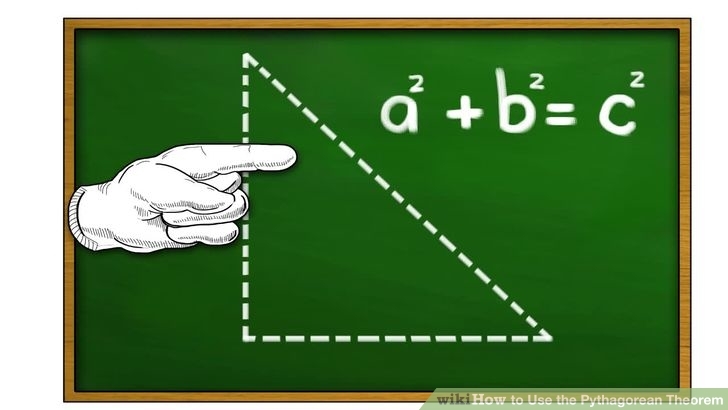 I can connect Point A to Point B, and I can connect Point A to Point C. If the angle made a A by A/B and A/C is a right angle then I could use the formula a2 + b2 = c2. 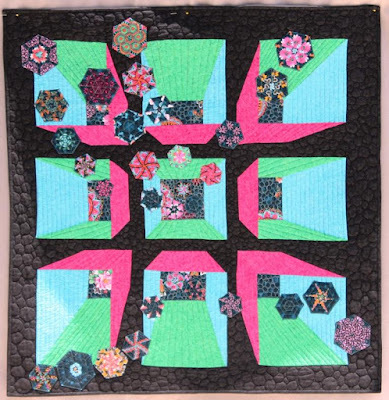 But I do not think that the junction makes a right angle. 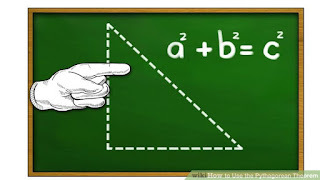 If I could calculate the angle created by lines A to B and A to C then I could use the formula for a scalene or isosceles triangle. That formula is a2 + b2 – 2ab cos c = c2. So do I guess? And the days of having a protractor readily available are long time gone. Well guess I’m going to do it by sight. Hell this is my virtual world, and I can do whatever sort of makes sense to me. 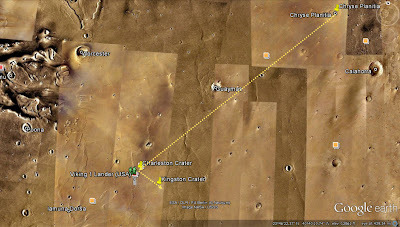 I know the distance from Chryse Planitia and Charleston Crater, according to WolframAlpha is 300 miles. By sight, on Google Mars, the distance between Charleston Crater and Kingston Crater sort of overlays the Chryse Planitia to Charleston by about 8 and 1/3 times. Dividing 300 miles by 8.33 I calculate that the distance between these two craters is about 36.0 miles. This is my 1,281st post. According to Blogger Jim’s Trek has recorded, as of this writing, 99,210 Pageviews.